On Friday afternoon, as a result of the controversy surrounding the publication of Mortality in Puerto Rico after Hurricane Maria (the ‘MPR Study’) by a Harvard-led team, the government of Puerto Rico released island death statistics as of May 31, 2018. 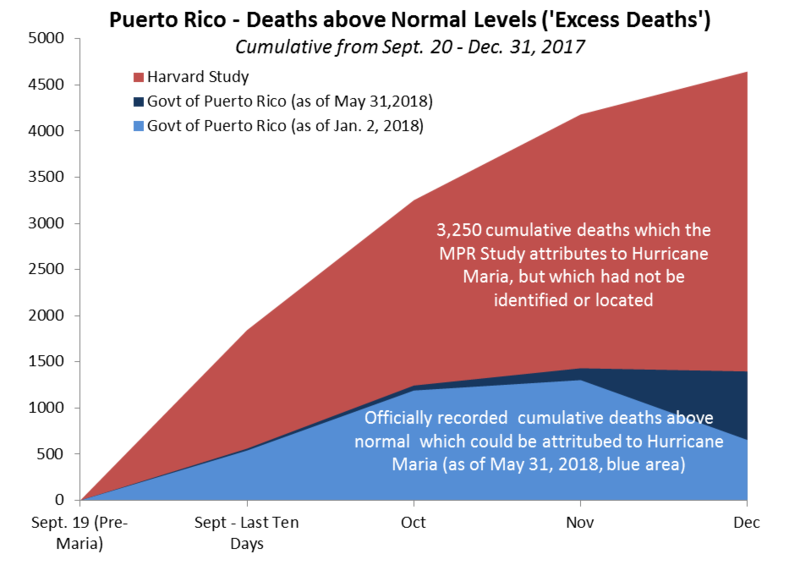 These statistics, which can now be taken as materially final through year end, indicate 1,397 excess deaths following Hurricane Maria for the Sept. 20 - Dec. 31, 2017 period covered by the MPR Study. By contrast, the MPR Study indicated 4,654 excess deaths as its central estimate for the period. As we discuss below, the official numbers are unlikely to change materially at this point, implying that the MPR central estimate was approximately 3,250 above the observed number representing an error of 232% over the actual figure. For Official Deaths, Puerto Rico Institute of Statistics via Latino USA as of January 2, 2018; via David Begnaud for May 31, 2018 release; for MPR excess deaths, Mortality in Puerto Rico after Hurricane Maria, with Princeton Policy monthly interpolations to MPR year-end total. Conceptually, government agencies and other organizations release their data on three separate bases: 'as of', 'preliminary' and 'final'. When data is released as of a given date, this represents the data available in the database as of that date. It does not necessarily reflect the total number expected for the month or an official final count. The difference between an 'as of' figure and a final official tally could be 30-40%. Data presented as 'preliminary' usually represents an early estimate of the final count, but could be revised by, say, +/- 8% to the final value. 'Final' numbers may still be revised, but generally fall within 1-2% of their ultimate value. Some agencies release only 'preliminary' and 'final' numbers, but it comes down the the specific practices of the agency involved. In the field of oil production, for example, Texas crude output as officially recorded by the Railroad Commission is materially unreliable until the sixth month revision following the initial publication. By contrast, North Dakota output as published by the state's Department of Mineral Resources can be considered materially accurate when initially released. It comes down to the practices of the institutions involved. Puerto Rican authorities appear to release death statistics on an 'as of' basis. Thus, data released on January 2nd and published by Latino USA and on May 31 published by David Begnaud of CBS should be considered 'as of' versions which may be subject to material revision. For example, the December death count was revised up from 2168 in the January report to 2820 in the May report, a revision of 30%. On the other hand, the November numbers were revised up only 5%, and the September and October numbers less than 1%, from the January to May release of death statistics. 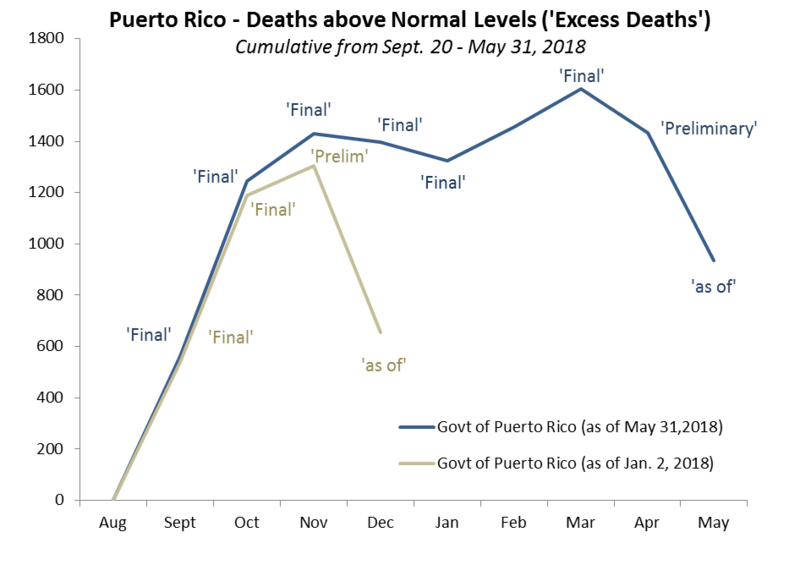 Consequently, the vintages of data available to us suggest that data from the third month prior and earlier may be considered 'final' and unlikely to vary more than 1% in future releases. That is, data through March 2018 may be treated as 'final'. Thus, the year-end excess death toll of 1,400 may be treated as a firm number in practice. It is nowhere near the 4,600 central estimate of the MPR study and relayed by virtually the entire mass market media in the US. The Harvard study was wrong, and by a wide margin. Therefore, as we wrote earlier, unless the Study authors can point to where 3,000 bodies undiscovered through March 2018 may literally be buried, we are left to conclude that they simply do not exist, and the Study must be judged as wildly inaccurate and a gross exaggeration of the true impact of Hurricane Maria in Puerto Rico. The data subsequent to year-end 2017 suggest that excess deaths continued to rise through Q1 2018, reaching approximately 1600 in March 2018. Preliminary data from April suggest this number may decline, but it is too early to make such a judgement with any confidence. On the other hand, Q1 data strongly suggests that there was no reservoir of 3,000+ undiscovered bodies at year-end 2017. We had earlier stated that we believed excess deaths would settle around 200-400 at the one year event horizon, that is, as of Oct. 1, 2018. This was based on a misinterpretation of the December tally issued on January 2nd as 'preliminary' rather than 'as of' -- a classic analyst mistake for which the responsibility is entirely ours. As a result, the December figure was revised higher than we expected. It is not yet impossible that deaths settle in our expected range, but given that a firm peak is not yet visible, excess deaths are likely to be higher than our expectation, and possibly materially so.